The Koala 1kg silver coin 2012 was minted by the Australian Perth Mint in 2012, as indicated by the title of this article. There were only minted 500 coins of this kind with a diameter of 100.60 mm and a thickness of 14.60 mm. What attracts many people to the Koala 1 kg silver coin 2012 is the staggering weight of one kilogram. It is a quantity preferred by those individuals that have specialized themselves regarding the investment into precious metals. The weight of this coin is the equivalent of 32.151 troy ounces of silver. Another attraction brought by the Koala 1 kg silver coin 2012 is its high purity. Silver of 99.90% fineness, otherwise said pure silver, was used in the manufacturing of these coins. When it comes to the Koala silver bullion coins, the design is a changing one a yearly basis. It is a model also encountered to gold bullion coins like the Australian Kangaroo and the Chinese Panda. It is specification that attracts collectors and investors who, with every year, await the new engravers and this thing is also valid for the Koala 1kg silver coin 2012. The tail side of the Koala 1 kg silver coin 2012 illustrates a lovely and fuzzy asleep koala on a branch of a Eucalyptus tree. At the top of this massive bullion silver coin is inscribed the name of the fuzzy animal AUSTRALIAN KOALA and at the bottom the year of manufacturing 2012, the weight 1 KILO and the fineness 999 SILVER. This warming reverse was realized by Elise Martinson. The head side of the Koala 1 kg silver coin 2012 has a majestic appearance of Queen Elizabeth II as it is also inscribed together with AUSTRALIA and the 30 DOLLARS face value. The effigy of the United Kingdom Queen was designed by Ian Rank-Broadley. To say that the Koala 1 kg silver coin 2012 is a proper gift would be kind of too much because it could be catalogued as an eccentric gift which should surely transmit to the receiver of the gift your entire appreciation which could actually be weighted; it weighs one kilogram of pure silver. 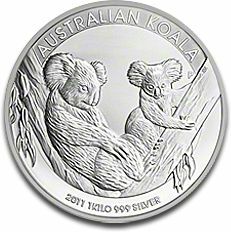 The Koala 1kg silver coin 2012 is destined to individuals that desire to make a serious investment into precious metals. It is an appropriate way to invest quite an affordable amount of money for many persons around the world because most of all it brings safety. As the price for silver increases, the value of the Koala 1kg silver coin 2012 bringing a considerable amount of profit to an investor or a collector. For numismatist this option to start a collection can be accompanied by the previous editions of this caliber. The scarce mintage is the first characteristic that impresses collectors and taking into consideration that this Australian coin that weighs 1 kg was minted in only 500 pieces, it could be considered a great choice. The Koala 1kg silver coin 2012 can be acquired from our website at a more than competitive price to which it is added a small percentage of VAT.